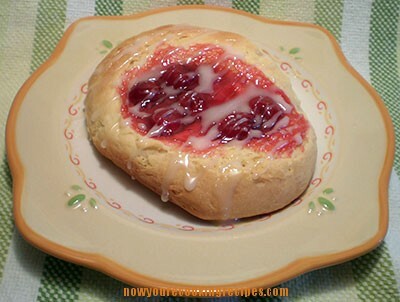 Gluten-Free Cherry Cheese Danish - Now....you're cooking! I must tell you – these are fantastic! 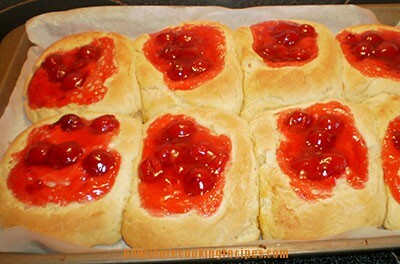 I have adapted this from Jeanine at The Baking Beauties sweet roll recipe. I wanted a special Easter breakfast, and I didn’t feel like cinnamon buns – so the cherry cheese Danish was born! I found a Danish recipe using packaged crescent rolls – that called for putting a layer of dough in the bottom of a pan, topping with the filling ingredients, and then topping with the remaining dough. I was going to give this a try, using Jeanine’s dough – but I decided to see what the dough would be like once I mixed it up, if I would be able to make individual rolls, and it turns out that I could. 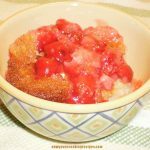 The recipe may seem a little long and daunting, but they are actually pretty easy to make. You could of course use any type of pie filling instead of cherry. Place a pan of warm water in the bottom of your oven (I used an 8 inch square cake pan with about an inch of water) and preheat oven to 170 degrees F. When the oven reaches the temperature turn it off. In the bowl of your stand mixer, combine the brown rice flour, tapioca starch, potato starch, pudding mix, sugar, yeast, xanthan gum, baking powder and salt. Mix on low to combine. Place water and butter in a microwave safe bowl or large measuring cup and microwave on high for 1 minute, or until the butter has melted. Add the milk, eggs, canola oil, vinegar and vanilla. Whisk to combine. While the mixer is running on low, slowly add the wet ingredients to the dry. If the dough seems too dry you can add a bit more milk. Let the mixer run on medium speed for 5 minutes until well blended and smooth. While the dough is mixing, prepare the filling by stirring the cream cheese, sugar and vanilla together until smooth. Prepare pans by lining with parchment paper (I used a 10x15" cookie sheet/jelly roll pan and a small 6x8" pan - if you have a larger pan you may be able to fit all in one pan). Wet your hands and flatten the dough down with your palm. Make a well in the center of each roll. (I used the back of my scoop, sprayed with cooking spray, to make an indentation). Place about 2 teaspoons of cream cheese filling in each indentation, and top with a good spoonful of cherry pie filling (I had a bit of pie filling left over). Open the oven and quickly place the pans inside (so the heat doesn't escape). Turn the oven light on for a bit more heat. Allow to rise for about ½ hour. When the rolls are nicely risen, remove the pans from the oven, and preheat the oven to 350 degrees F.
Bake in the preheated oven for 25 to 35 minutes, until they are lightly browned. Meanwhile, make the glaze by combining the icing sugar and vanilla in a small bowl. Gradually add enough milk or cream to make a thin glaze. Drizzle glaze over rolls, and enjoy. These can be frozen and reheated in the microwave. I like to store the glaze in the fridge and drizzle the glaze over them once reheated - otherwise the glaze "cooks" before the roll is as warm as I would like it when reheating. Oh – those do look GOOD!! Now that is good use of the dough recipe – I’m glad that I inspired those! 😀 Fabulous job!